There are several things report today DIY Dad has started again in earnest and has told me firmly that I must expect to listen to rambling useless diatribes about plumbing and so on. I thought I was just here to cook the food and do the washing. Given the weather was actually rather nice I was finding it very hard spending time indoors looking at depressing breezeblock walls with remnants of 1960’s decor peeling in an unromantic fashion. The solution I came up with was good. I suggested a walk to look at some of my favourite fungus sites. The boys were promised ice cream and a bag of crisps. They complained bitterly but under sufferance they did come, muttering and threatening retribution. In the woods we found that there were no chanterelles or ceps but that the hedgehog mushrooms were beginning to fruit and we found two nice birch boletes and two very small beefsteak fungi. I photographed them before stir frying them. The boys got their ice creams in a village shop and I got my Saturday paper, their humour improved on the walk until they had got back to being the boys we had on holiday. On the way home we stopped for a drink in a pub overlooking the village green and then went on to the DIY store . Husband was in seventh heaven, fungi, beer, and a DIY browse all crowned by catching the car getting to 90,000 miles on the way back……and it still keeps going. 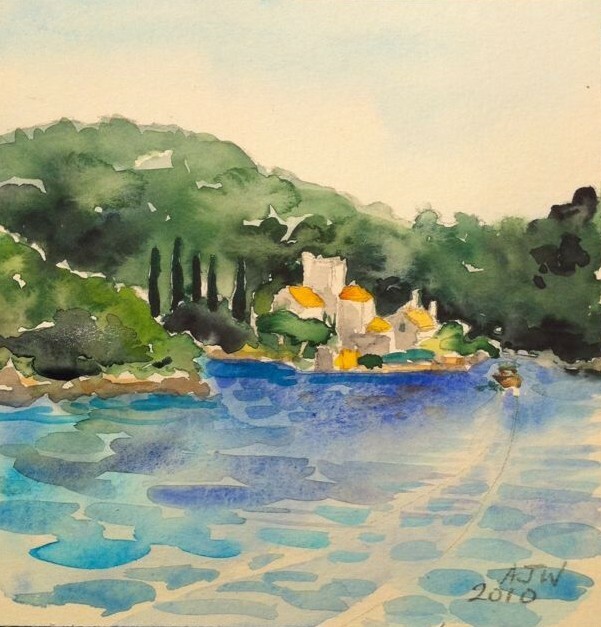 I had another go at reworking the picture of the beautiful Benedictine monastery in Mljet this time I put in the boat which takes people out to the island. No2 son has been very informed and pretty clever, he has found and set up a new web-site on which I can sell work without a time limit. Its being called the lemonaday shop and will feature old pictures from the blog and other work that looks like it fits in. That’s it I should be home surveying the shrivelled remains of my garden. It might have rained but I hear not. 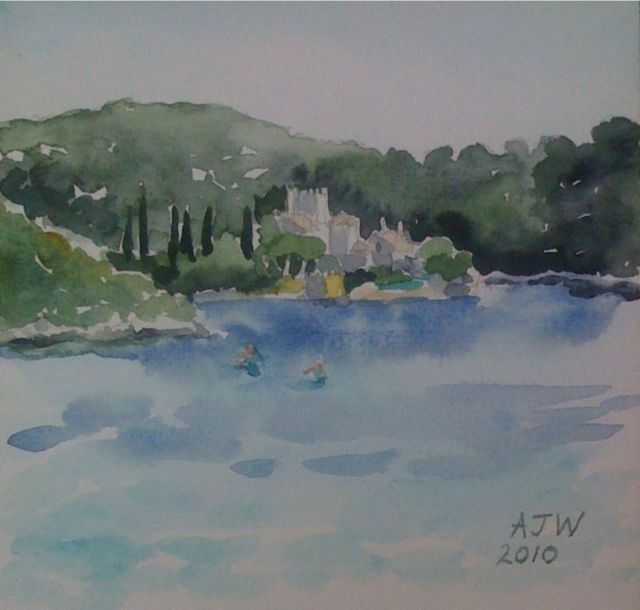 Dubrovnik was amazing but much too busy and hot to paint besides I was far too busy people watching. The national income must go on outrageous shoes and underwear good enough to be on permanent display due to the slashed /shirt length dresses. They all spent ages being photographed sitting in poses borrowed from Page 3. Asking when the icecream parlour closed, we discovered it was 2am!!!! This is a working sketch of Babine Kuche. Looking back to Mljet from Dubrovnik. This is the view from the Mali Raj restaurant where we had an amazing meal of traditional roast kid with vegetables. The previous day I had sketched the view over an expresso break. At the moment I am sitting in the shade outside the Orthdox church in Dubrovnik recovering from the walk round the walls.This place is all steps but very beautiful . There are huge numbers of tourists here and if I came again I would make sure it was earlier in the year or autumn. 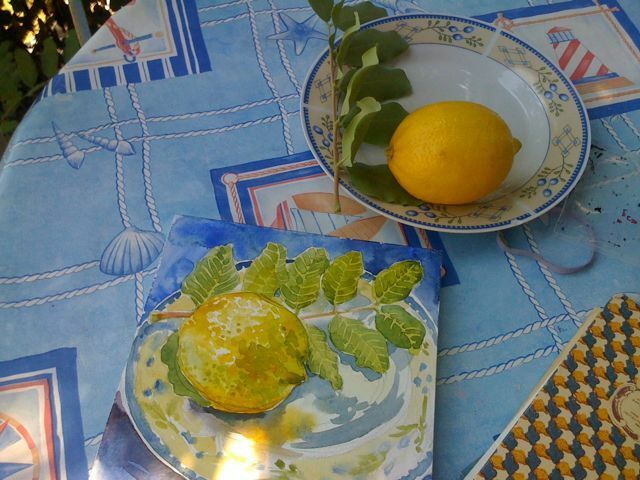 I am still in Mljet in Babine Kuche it is the epitome of a Mediterranian fishing village. Steep stepped lanes lead up to tiny houses, the sea is a landlocked lagoon,palm trees line the road along the quayside. 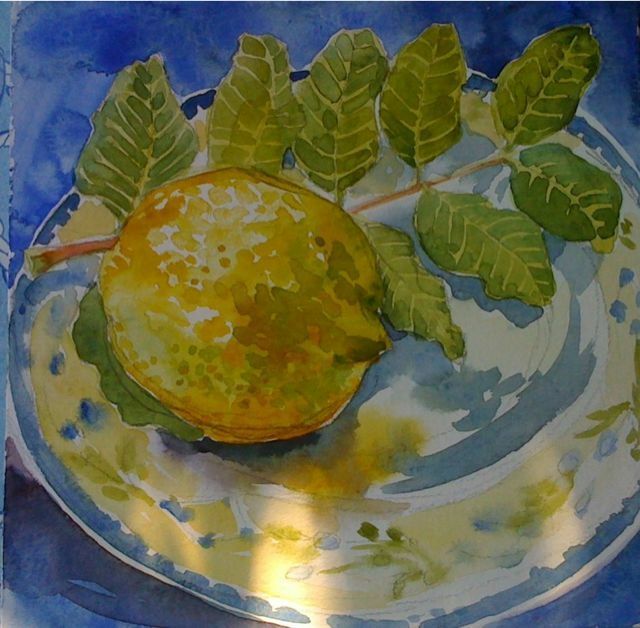 I did three paintings today, first the lemon, then the view of the monastry on an island in the lagoon from the cafe,then the view of the villa across the lagoon. While I did this I sat on the sea wall with my toes in the water. A fish with stripes and blue and orange splashes went along the rock edge.